UPDATE 20 February 2019 at 10.03PM: after the announcement of the Grand Départs of the Tour de France 2019 in Brussels and of the Tour de France 2020 in Nice it was almost sure that the Grand Départ of the Tour de France 2021 would take place in Copenhagen in Denmark. Today, Europe 1 seems to confirm this information, even though A.S.O. hasn't send out a press release about this (as a reminder, the Grand Départ of the Tour 2020 has been officially announced on 12 March 2018 so we're getting close to the time at which it is officially announced). In its article, Europe 1 cites Christian Prudhomme who would have indicated concerning this most southern Grand Départ in the history of the Tour that "It's a story about the biggest cycling race coming together with the most cyclable city in the world: in Copenhagen, there are more bikes than inhabitants. [...] We definitely want to densify the link between the bike for daily use and the bikes of the champions". - second stage: Roskilde > Nyborg - 190 km, of which the last 18 will be above the Baltic sea, on two huge bridges which are exposed to the wind, which will definitely break up the peloton! UPDATE 25 January 2017 at 7.30PM: early this afternoon, the Danish newspaper BT announced that the Tour de France won't start in Denmark in 2019. That's not a real surprise for us since you may have read on velowire.com since 22 May 2014 already (!!) that the Tour de France 2019 will most probably start in Brussels in Belgium! In any case, today's information indicates that Christian Prudhomme (director of the Tour de France and director of Cycling with A.S.O.) informed the Danish minister of Economics and Growth, Brian Mikkelsen, that the Tour de France 2019 will not start in Denmark. Indeed, the minister who contacted Prudhomme himself to ask for news about the country's candidacy we talk about in this article, indicated that Prudhomme is still very positive concerning the venue of the Tour de France in Denmark and that A.S.O. remains very enthusiastic about this candidacy, but that there are many requests coming from different countries in the world. In this context, Denmark is not on the planning for 2019 for A.S.O.. This thus means that a Grand Départ in Denmark still remains possible for 2020 or 2021 and the Danish minister indicated about this that Denmark has a real chance - I'd say 75% - to have the Tour in 2020 or 2021. We'll continue to discuss with A.S.O. and Christian Prudhomme encourages us to continue. He didn't promise us anything, but the fact that he encourages us seems quite positive to me . In order to continue to show their own enthusiasm, the Danish organisers by the way plan to come visit Paris-Roubaix this year! For me this is yet another reason to think that the Tour de France 2019 could indeed start in Brussels! Since these stages will cross several bridges, this will add an original side to this programme from a sports point of view: indeed, these first two stages in line will be exposed to the wind which will probably lead to the peloton breaking up in smaller groups. This programme proposal was official presented to A.S.O. 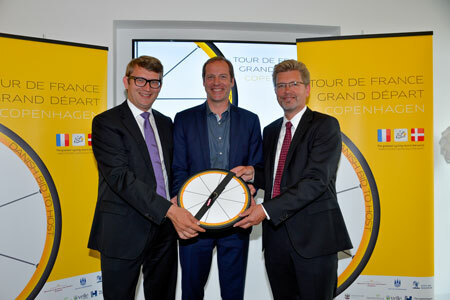 and more specifically to Christian Prudhomme, the director of cycling at A.S.O. and director of the Tour de France by the Mayor of Copenhagen, Frank Jensen, and the Danish Minister of Commerce, Troels Lund Poulsen, at the House of Denmark which has its balcony with a superb view on the usual finish of the Tour de France on the Champs-Elysées! Without any pretention, Denmark presented its proposal with the title The greatest cycling race in the world meets the best cycling city in the world! For now, Christian Prudhomme simply declared: We are proud to receive Copenhagen's official candidature, which underlines the attraction that the Tour can have outside of France. Showcasing the Tour abroad also means showcasing France. Of course, it would be a huge challenge because it would be the most northern start in the Tour's history, but we well know that in addition to proudness there is some kind of reality in what A.S.O. plans for being a potential start of the Tour de France in the next few years! Concerning the distance, this shouldn't frighten off A.S.O. because the company already organises the Arctic Race of Norway.